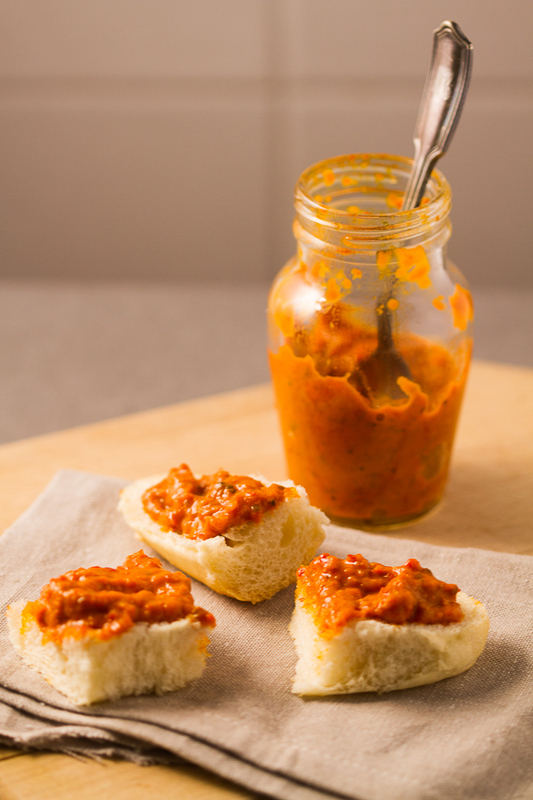 If you want to improve store ajvar (the famous Balkan roasted eggplant and red pepper spread), or you want to make it the easy way, here’s the quickest “not from scratch” recipe. I call it cheat ajvar. Ajvar is a deep, rich, spread famous in the Balkans. It’s made by first roasting red bell peppers and eggplants, and then cooking them over low fire for several hours. There are a couple of variations on the theme, and a few more additions you could include. 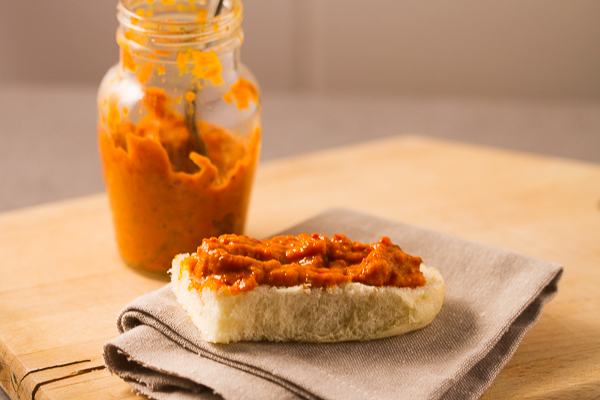 Garlic, for one, gives ajvar an incredible taste, however it does cut down on the time it keeps. Chilis are also a great add-on, but a lot of people prefer the milder option. Making ajvar takes a long time. It’s something that’s usually made over a weekend, or at least a day and a half. This is why today’s version is of such importance. However, today’s recipe can only help you if you can buy ajvar at the store. Non-homemade ajvar is generally of a lesser quality. Usually the ingredients are not roasted at all, and instead are only cooked. 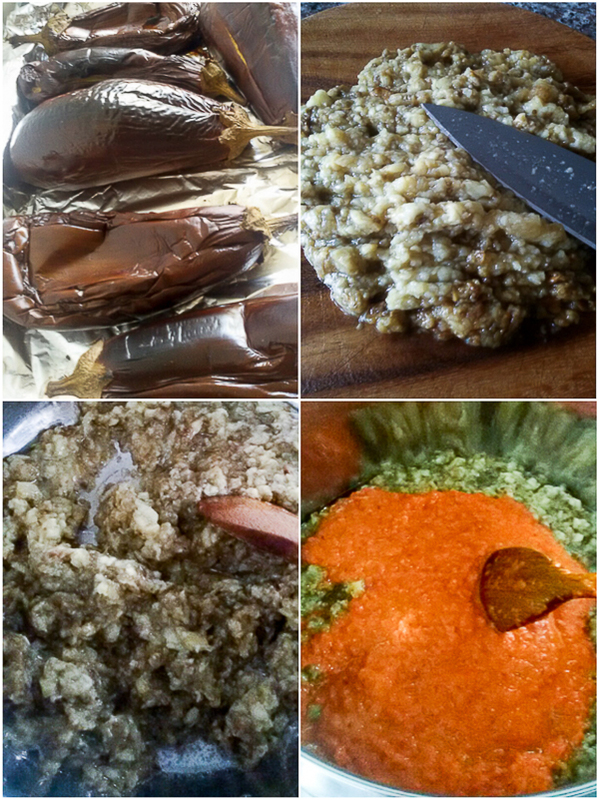 Sometimes some of these ingredients, such as the crucial eggplant, are even skipped. This gives it a very “manufactured” taste. Although, if you’ve only tried the store bought version, you may think it’s great. I promise you though, it’s not even close to what it can be when it’s improved a little bit. And today we’re doing exactly that – improving. So grab a few larger jars (24-ounce +) of ajvar, as many eggplants as the jars, and meet me in the kitchen. I’m a stickler for tradition, but I’m also aware we’re short on time. I’d rather you try ajvar in any form, than not try it at all. 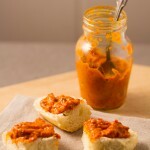 So I did a thorough search to find ajvar recipes that are worth your time and effort. When I say thorough, I mean I dissected many, many recipes I came across. One of my favorites is Yosmar’s take on ajvar. It’s a joy to see someone who knows food so intrinsically take something like ajvar and simplifies it while keeping the taste in tact. 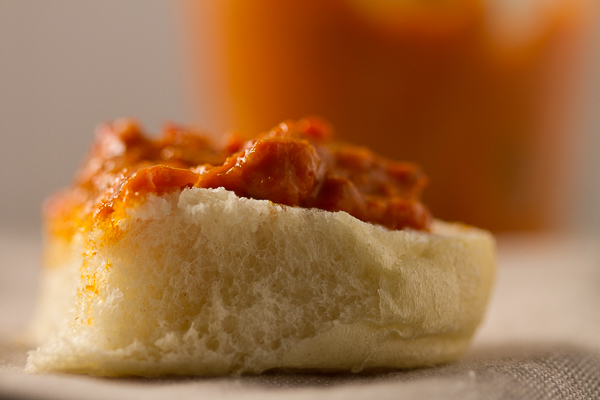 Yosmar’s ajvar is complete in a shorter period of time. Also, she makes hers with red bell peppers. As she points out, bell peppers’ physiology is similar to roge (aka Balkan version of bull horn’s sweet peppers). Her recipe calls for a blender instead of meat grinder greatly cutting down on preparation time. Like a pro she is, she grills eggplant and peppers before cooking them. Grilling vegetables separates mediocre ajvar from the first class ajvar. Finally, for those of you who like to cut down on oil, Yosmar uses smaller amounts. Whisk and Spatula, Yosmar’s food blog, is a curated collection of unique tastes, where you can find anything from ajvar to cured eggs. 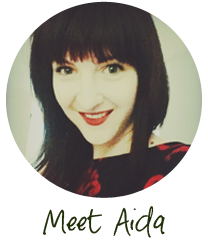 As she points out, she blogs about what’s on her mind and her food is inspired sometimes by the seasons and sometimes by her travels. Check her out! Thoroughly wash, then pat dry whole eggplants. Cover a baking sheet with foil (or the rack itself if you don’t have a baking sheet), and line it with eggplants. Roast for approximately 40-45 minutes, turning them around about halfway (don’t be overly concerned with time, instead, watch that eggplants are roasted, but not burned). When done the eggplants will “raise” their skin, and will have a few brown-black patches. They’ll be soft and moist. Take out and place in a large bowl. Cover with a plastic bag, and leave to cool. Peel each eggplant by cutting off the eggplant stem and discarding it. Then use a knife to take off its skin and black dots that formed while roasting while keeping as much meat and seeds in tact as possible. Bring down the temperature to low and add ajvar from the jars to the pot. Stir well. Cook for the following 1.5-2 hours on low. The ingredients will essentially be boiling most of the time, and the air bubbles will be coming out. It’s imperative to continue stirring ajvar throughout the entire cooking time, that’s every few minutes, to prevent burning. You will also be adding about 2-3 cups of oil to the pan throughout the cooking process, a few tablespoons at a time (every fifteen minutes or so). Stirring is a tedious process, but if you skip it, your entire effort will be wasted. Basically, as you are stirring ajvar, you are making sure it’s not burning, and you’re adding some oil at regular intervals while stirring. At the very end of cooking, add in sugar, and (optionally) salt. You can taste ajvar to see if it needs more of each, but make sure not to burn yourself. Meanwhile, heat oven to 250°F. Wash several jars in hot, soapy water and rinse well. Pat dry. Place on a baking sheet and put in the oven. Warm them up for fifteen minutes. This will sterilize them. Once the jars are hot, and the ajvar is turned off (it’s still extremely hot so be careful) you’ll be transferring hot ajvar to hot jars. Use thick kitchen mittens to pick up jars to protect your hands and fingers. Be very careful while you transfer ajvar into jars. Do jars one by one, and fill each up to the top, leaving the part where the ridges empty (so fill up almost to the top, leaving the top portion empty). Ajvar can last several months. Ratio: 1 eggplant per 1 (25ounce+) jar of ajvar. (Optional) Before serving, mince in a garlic clove for an even better taste. If you’re cooking on a gas stove, be mindful that ajvar make take less time. Look for the deeper orange hue and creaminess. You want to end cooking before it becomes darker. Gluten-Free: for a gluten-free version ensure you are buying gluten-free ajvar from the store. The remaining ingredients are gluten-free.